Travesty continues. After episode 19, whatever Sik Sik feels or does, it is just bad storytelling. And as predicted, she has second thoughts and asking the most insane question ever. Thanks to Chin Chun for putting it very succinctly to her. Sik Sik and Ruco still work closely together, except now she is in the arms of another guy who trusts his girl with his best bud. Ruco still tries hard to make her laugh and what does she do? She laughs as she whips him, jokingly. If being familiar with each other is new definition of romance, then she and Nic is doomed in the sense she never whips him. BUT she does tell Nic her deepest feelings so how ah? Who does she love ah? Meanwhile Yee Kiu wants to end her contract because she feels she is not given promo priority and her manager basically says if she doesn’t have a new good song she is done! So she goes drunk before Ruco and cries how she deserves his hate and the comeuppance for what she did to him with much regret blah blah blah. And guess what Ruco do? He quits his job which Char Gor pleadingly pleads with him to reconsider until Sik Sik sees his eye wink thing and explained who he really is much to everyone’s ooohhhs and ahhhhs and wows. So Ruco goes back to music business. But he isn’t happy because he has got no inspiration. His mom sees him not happy at all and wishes he doesn’t go back to music world or even do Yee Kiu’s bidding but Ruco says he and Yee Kiu are just friends and he is doing this because he wants to compose again. Meanwhile Sik Sik discovers a few things. She discovers prior to leaving Ruco saw Char Gor and explained that if Sik Sik is ever blamed for anything, Char Gor must not believe those rumours because Sik Sik is a capable staff and she is like mother hen protecting her fellow colleagues so she will take all blame. Sik Sik is very touched by this revelation. She also discovers Ruco has a similar green shoe (prior to him leaving but Ruco explains he bought that for a friend and everyone guessed Yee Kiu). She finds that she misses him, sees durian and coconuts she remembers him, remembers the accidental kiss and did see him one time far away, in a car with Yee Kiu and decides to turn away, regretfully. Basically she misses him. Anyway Sik Sik is walking and bumps into Ruco’s mom and Ruco’s mom introduced herself and they ended up chatting. Sik Sik asks if Ruco is ok and how’s he doing and Ruco’s mom sadly says that he is not doing well, hardly smiled. That he was so stylish and handsome sitting in front of the keyboard, now he is sulky and unsmiling and unhappy. Sik Sik asks isn’t he with Yee Kiu and Ruco’s mom laughs at that quite cynically and says they’re not together and thank god for that and Sik Sik says Yee Kiu is nice, she encouraged Ruco to return to music world so she is nice and his mom says she has ulterior motive and moreover Yee Kiu hurt Ruco a lot in the past and stupidly Sik Sik says they parted ways due to some argument, didn’t they but his mom explains the whole sordid tale and Sik Sik finally knew why Ruco didn’t want to go back to music world and says in a quiet voice that she helped Yee Kiu in persuading Ruco back to the music world. Sik Sik, puh-lease don’t give yourself too much credit. He returned due to Yee Kiu and his pity for her and also not to waste his or her talent. Not because of you. You did nothing except to sulk and emotionally blackmail and then shutting him out of your friends zone. And don’t say he left to avoid her unless the script was changed after it was filmed. Mom asks Sik Sik to have a chat with Ruco sometimes because she feels Ruco was happiest when with the agency and someone there made him really happy. Sik Sik kinda knew who she was talking about. And mom notices her shoe and remarks that Ruco has the same pair but sitting in the room for a very long time. Sik Sik is curious. She chats with Chin Chun, she keeps asking why why why about Ruco, why he bought the shoe lar, etc and yet not own up to it. Chin Chun couldn’t stand it and blasts her as he says “Does it matter? Doesn’t mean he is in love with you! Because you were both in Malaysia so long he didn’t say a thing. Ok, so what if he is in love with you? So then what? Will you leave Nic for him?” and Sik Sik says noooooo and Chin Chun continues “There! You said it! Don’t confront him. What if he says he doesn’t love you? You will be put on the spot and be embarrassed, And if he is? He is Nic’s best friend! What will he do then? Forget about it Sik Sik!” and so she shuts up. GOOD CHIN CHUN!! You said it so well!! Meanwhile Ruco has a terrible time writing the music and Yee Kiu doesn’t appreciate his slowness and pressures him to do it quite and he glumly says no worries. When he does give her the song, she hates it. She scolds Ruco, accuses him of deliberately writing a subpar song for her as revenge so that her career will be ruined! Ruco is hurt by the accusations and explains 3 years ago he had a car accident and since then he can’t even play the piano or write music. Now he thought he could give it a try, perhaps find that composer in himself again but realises he has lost his musical mojo. So he can’t help her and sadly he leaves and only then Yee Kiu realises how much she has hurt him, 3 years ago and now. B-I-T-C-H. But at least an honest one. School reunion or something and suddenly Wong Kei Ying is remembered, she appeared looking lovely and doesn’t go new Sik Sik and Chin Chun where Chin Chun criticises Kei Ying, saying at least she dares not approach them. If Sik Sik can forgive Nic, why can’t she accept Kei Ying, again? Why the double standard? Kei Ying gets insulted by a creepy old school mate who says she is easy and sleeps with best friend’s fiance so why won’t she go easy on him? Nic is handsome, tall, rich and somewhat nice. Even sluts have standards you know? Kei Ying is disturbed as the guy sexually harasses her and Sik Sik and Chin Chun to the rescue and each kicked and slapped him and they left the venue as friends. Kei Ying stops and apologises to Sik Sik with much regret and Sik Sik forgives her and that’s when Kei Ying knows Sik Sik is back with Nic. Meanwhile Sik Sik sees Nic with another girl and realises she can’t trust him but it turns out the girl is asking for direction and Nic did not lie to her so she breathes easier. She sees her sis checking on Jun Weng and even installed a tracking app in his phone and Sik Sik realises she worries what Nic is doing. Chin Chun says probably meeting or ran out of battery or something. Anyway she helps Chin Chun to deliver cake to a customer, is walking when she sees Nic who canceled their lunch or something with Kei Ying in a flower shop chatting closely. She is alarmed and calls Kei Ying and Kei Ying lies she is in a meeting and as she puts down her phone, unfortunately Nic and Kei Ying also laughs and in Sik Sik’s mind, quite sinister way whilst in my mind she is probably helping Nic to choose flowers for Nic to propose to Sik Sik again. But Sik Sik no longer trusts Nic. And my guess is next episode she will reject his proposal and gives a teary explanation how she no longer trusts him and so shall leave him. But the question is does she still love him? Sigh… what a total dud. Everything is just excuses. If she leaves Nic this way, it just shows she doesn’t have it in her heart to truly forgive, unlike Ruco who forgives Yee Kiu and even helps her out. She should learn from Ruco; if wanna forgive, do it 100%, if wanna reconcile, do it with a trusting heart. Nic really changed I think and if so with Sik Sik leaving him just shows Sik Sik in a poor light. I’d rather he gives her away as his last act of gallantry to her and to his best friend, Ruco. As for her forgiving Wong Kei Ying, well it does happen in real life. No comment. Ruco Chan rules. So handsome. Tony Hung is doing fine as an actor. He can act and I like how he casually scolded Aimee’s Sik Sik. Very natural body language even if I don’t quite like Chin Chun, eventhough he has given up on Sik Sik. 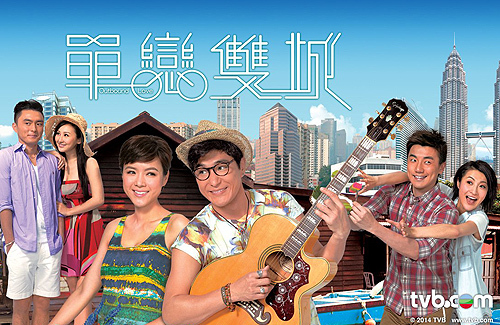 Matt Yeung is like reciting his lines, without emotion, passion or even life in him. Is he the walking undead in the undead romance series? 1. how fake is her happy big laugh like she was forcing herself to go ha ha ha when Sik Sik is supposed to be naturally boisterous and laughing loud and nothing pretentious but to these 3 people, she was pretentious in her laughter. My explanation is she has no middle path to her acting; either too happy or too glum. Sik Sik is clearly not her role. I stand by my opinion; she is a total miscast as Sik Sik. 2. she has zero chemistry with Ruco Chan. Zero may be a bit too much but I do find that individually each gave their all in scenes together; Ruco was really in top form as playful Luk Kung Tzi except in this episode he was a bit forced because we know Luk Kung Tzi’s heart is hurting so whatever he did to make Sik Sik laughed was his way of shutting up his sadness. Aimee also tried very hard but I feel she was never fully relaxed with Ruco in some ways eventhough this would be her most energetic performance except she was not natural in every way and more importantly, it is true there is no chemistry between she and Ruco Chan during the most important moments like kiss, lingering looks etc. 3. her bad acting. This I am not so sure. She is a competent actress but Sik Sik isn’t her. My friend even lamented how Ruco never had a good lady costar that fits him well. In some ways this is true. Or maybe he is just not like Bobby Au Yeung who fits every lady actress thrown in his way. The fact remains, this series is going nowhere except the inevitable end. The journey is insipid and uninspired. For a romantic feel good series, I have said before, it is undead roundabout non-romance non-feel good series. It just throws in every classic supposed romance settings but never quite even got the 2 characters close to lingering looks at one another. They were flirtatious colleagues. The fact that neither Nic or even Yee Kiu is a villain, especially Nic made the whole romance impossible. And the fact that neither Nic knew about Sik Sik’s sadness or Sik Sik about Nic’s turmoil made me wonder how these 2 can even get together in the end. Because Ruco already loves Sik Sik for reasons I never quite understand and Sik Sik will return that love because of what he did for her rather than what she felt about him. I said this a few episodes before. There is nothing deep in their attraction to one another and I feel Nic knows Sik Sik more than Ruco and Sik Sik knows so little about Ruco except assumptions, presumptions and what others tell her. They never had this deep connection except both were hurt before and even that hurt never quite manifested as a talking point between them. If only in Episode 19 whatever Sik Sik said and cried and all was to Ruco and not to Nic, I will see that emotional connection. Because of the lack of it, their togetherness to me is so fleeting and not deep enough. Outbound Love fails in every respect in terms of two people meeting, falling in love, torn apart and got together. At each stage nothing much happened and whatever happened will not incite that gleeful joy in me that goes YES! YES! YEAHHH!! when they do get together. In fact I think she is better off with Nic and Luk Kung Tzi better off with … me perhaps, just not Sik Sik. 2 more episodes, tomorrow back to back, will it move earth or will it not even move dirt? We shall see! Ruco… you have been cheated of a good story. What a waste of a handsome talent. If anyone tells me Aimee and Ruco is such a fine pair in this series which is so romantic,clearly you do not know a good romance series. This is an example of a failed one. 20 episodes and still nothing in sight. I am waiting for Sik Sik to do something for Ruco but so far she had done nothing. Anyone knows the title of the ending themesong, the one that Ruco sings? Thank you 🙂 This is a lovely song and Ruco sounds so good in it! I thought something like I want to be your guardian angel? Did elaine sing the female version? WHo sang it? I want to listen to elaine version? where can you find it on youtube? Read on a forum that the singer isn’t Elaine. The girl version sing in episode 22 was Elaine, 100%. so good. But short after a cover by another girl came out. I really hope that Elaine version come out first tho. no Norika, it isn’t Elaine singing in the drama. It’s that girl Kayee. She wrote in the intro to her clip that she’s the singer for Elaine’s character. Jayne star seriously need to find another writer. Very bias!! Which part is this biased? Which do you disagree with? Aimee Chan? Probably the Ruco parts!!!! Lol. I think Ruco would have better luck with an older more independent type female screen partner. Always feel the lack of chemistry is due to all the girls he gets paired up with feel like a younger sister instead of lover. I also hate his hairstyle in this show. I actually love his hairstyle by the end of it, especially that composer look. Disagree, he doesn’t have chemistry only with Aimee cos she’s such a lousy actress. As for the hairstyle , you’re probably referring to his curly mop but I thought it suited the character that he’s supposed to portray, that of the devil-may-care tour guide in Malaysia. His hairstyle was a little different in the HK scenes, tamer not so curly and suited his more serious persona in the second half of the drama. He looked breathtakingly handsome in the final scene in that all white outfit. I agree this isn’t the best example of a successful feel good series… What are thoughts on brothers keeper? Also stars Ruco, that’s on my to watch list after this. But are there any other really good dramas that you recommend? If Ruco, go for Reality Check and skip Brother’s Keeper except for middle episodes where he was the security manager. Very handsome and some happier times. The rest was just insipid. I also liked the lighter series No Good Either Way where he looks similar to Luk Kung Tzi. These 2 didn’t garner much attention but I felt these 2 were some of his bests, with Reality Check being the best. I am watching Steven’s Storm In A Cocoon. So far so good. Steven always has this ability to choose or rather being given characters that suit his strength. I also like Gilded Chopsticks for what it is worth. I’ve written quite a lot about Brother’s Keeper, with major spoilers, you can click on my name and search the list. I also feel that Reality Check is one of Ruco’s best works so far — in fact, I’m rewatching that series right now and enjoying Ruco’s performance just as much as I did the first time around. Part of the reason why I prefer Reality Check over Brother’s Keeper is because RC is more of a character-driven series with a simple plot that relies more on the inner emotional acting of the cast to move it along, whereas BK was too bogged down by a tedious plot and improperly developed characters, which made it too laborious and frustrating to watch. Of course, this is purely my two cents — take it for what it’s worth…. I think you should definately watch Brothers Keepers because, although there are problems with the storyline, Ruco’s performance is simply phenomenal. I would go as far as saying it’s probably one of the best acting performance by a male in TVB in the last 10 years. i also like Reality Check the most, i think it was the best show of 2013 (besides Days of Days and Karma Rider) in terms of editing and balance – less boring scenes … i love Ruco in Brother’s Keeper too, very good acting in there … No Good Either Way is also a well balance drama. Funn doesnt like BK but a lot of people do. On Douban, this drama has really high ratings with 25% rating it 5 stars, 46.6% 4 stars and 25.6% giving it 3 stars (totalling 97.2%), much higher than Will Power and On Call2. Decide for yourself if you want to take Funn’s opinion or that of a broader sample of audience. If you’re watching BK, the best episodes are 10, 12, 17, 18, 19 (very intense and great acting not only from Ruco but Timothy Cheng and Louis Cheung), 22, 23, 24,25 (if you want to watch how Fabio comes between Rachel and Sam), ep 7 and 8 for the sweet Sam and Rachel moments and ep 9 for the reunion of the 2 brothers. That’s news to me because a lot of people also hated BK. Yes watch it for yourself but the criticisms are valid even if the series is popular; much like this series Outbound Love, despite its good ratings suffered from many “defects”. Brother’s Keeper was the best drama in 2013. Seriously it was good so I don’t know why some people say it’s horrible. It’s not. I guess I don’t analyze a drama, I just watch and enjoy it. Yes the interesting episodes are 6,7,8 (Sam and Rachel get together) then 23-32 (Fabio break up Sam/Rachel and sam’s life changed to worse) was all good! No wonder quality if slipping. I won’t argue there are fans of BK for various reasons. I don’t hate it per se but it was a poor series. 5 years down the road, not worth rewatching unless biggest fans. And I can’t see how anyone can be fans of the 1 insipid male character and the other insipid female character. Ok forget about Brother’s Keeper. I have said too much on that unworthy series. It’s also news to me that a lot of people hated BK. Despite its flaws, it is enjoyable to many people who don’t watch a drama for the sake of picking it apart and criticising every minor detail but view with the larger picture in mind (and with a grain of salt if i may add). Granted that some of yr criticisms are valid but it doesn’t make it any less enjoyable for the majority of us. Problem with you Funn is that you always think your opinion is right and everyone else who disagrees with you has poor taste! I didn’t pick it apart and tried to watch most of it. Just couldn’t – found the plot tedious. I’m also one of those people who can watch super-long and slow Chik series. see, that’s what i always said that “one man’s meat is another’s poison”. gee hates Queen Divas but you love it. Don’t put words into my mouth. I never said others have poor taste so directly but at least I stand by my own. I am not here to please everyone by being non committal. I like, I will say I like. I hate, I will say I hate. It is a matter of my own opinion. I don’t say I hate it but others like it as if I am the only one who hates it. That is misrepresentation of its worst. Really? pls go back and read your comments rubbishing anyone’s opinions or comments which you don’t agree with. Definitely you stand by yr opinion as we all do. Just respect other people’s opinion without putting them down, that’s all I’m saying. I’m not asking you to please anyone. I don’t put people down and just because I use I and I assert myself firmly doesn’t mean it is my act of putting down people. If whatever I write is disagreeable and many do disagree they will assert themselves. I don’t see why just because I assert myself strongly I am considered the negative aspect and the opposite is supposedly the positive aspect. I disliking someone or a series doesn’t make me the lone one out there because you made it seem as if I am alone on this when there are many sharing the same opinion. Just because you like it doesn’t mean you represent the majority. Your criticism against me can be levied against you. As for me rubbishing other people’s opinion, I have others doing the same to me. We rubbish one another with reason. I am not rude but I don’t feel the need to be diplomatic with rubbish opinion and there are those whose opinion is as you say it, rubbish and I feel nothing wrong in pointing that out as others have pointed my rubbish opinion at me. You go on with your diplomatic stance and I will go on with my assertive stance but please don’t point finger at me about respecting other people for their comments. Take a read in this site and there are others worse in expressing themselves. Rubbishing other people’s opinion isn’t terrible if it is made with good reason and it can still be made politely and I have never been as rude as you claimed me to be. Likewise to you, just becos you don’t like it doesn’t mean you represent the majority, so stop pooh poohing other people’s opinion, saying things like “no wonder quality is slipping”, “stop accepting rubbish as art” (and many others worse than that which i cant recall but they’re all over Jaynestars if you care to look through your comments)and all those such similar kind of rude comments as if only you know best. You’re human like the rest of us, what you like you praise to the skies, what you don’t like, you tear it down like it isn’t worth two cents. I don’t blame you cos that’s just human nature. Just wish you’d stop behaving like you’re the be all and end all authority on everything. You’re too big for your boots. i like Brother’s Keeper alot … especially Ruco in the last 10 episodes ^ ^ … im of the same feeling about BK as @buzz, except i dont quite like Rachel’s portions. Wow what happened here? Lol. I just feel that Ruco is always praised in here. He is the best and everyone else that co-star with him is just rubbish, not good enough or bad acting or script is horrible blah blah blah. Even the top 5 tvb actresses are not good enough to pair with him haha. Maybe he should just do Hollywood movies, tvb is not for him lol. Louisa Lee is good for Ruco … nobody complain about louisa acting as his mother. by the way, priscilla wong and elaine yiu is quite matching for ruco too … people seems ok with the “ruco & priscilla” pairing in Reality Check … which does not mean that people are rubbishing all his co-stars. kristal tin was also paired with ruco in No Good Either Way as his wife … not much of love chemistry though, but nobody complain so it should be ok for the audience i guess =P … Kristal Tin is TV Queen, so can she be considered as a top FaDan? I disagree, I thought Kristal and Ruco had the best love chemistry, moreover they were supposed to be “old” couple but you can still see those little flirting and such. Kristal went all out, so was Ruco. @Funn … haha, actually i was just trying to stress the point that the viewers here dont criticize for nothing (including the both of us ;-)) … lately there are so many people here bashing Ruco’s costars definitely there is a reason (polite form of ‘there is something wrong =P’). anyway, as viewers from malaysia … i think we do have a right to voice our opinions and criticm isnt it =) ? … the drama may be free in hong kong, but we have to pay so much for cable tv and dvd to watch it in malaysia. but really i like the pairing of Becky & Ruco, they sang together in some event, they duet very well. although Ruco & Linda is not really matching in Brother’s Keepers … i have a strong feeling that they will look like a matching couple in The Apothecary ^ ^, but a tragic one =( … somehow i dont know why from the preview, i feel like it seems that ruco’s character in The Apothecary is like Raymond Wong in Sweetness In The Salt. I actually haven’t watched the entire series from beginning to end, but did watch a few episodes here and there (primarily because of Ruco) — I will be honest and say that from the little I did watch (including the 2 finale episodes), I completely agree about the lack of chemistry between Ruco and Aimee. Is it just me or has Aimee’s acting gotten worse rather than better? At one point she was actually improving as an actress (I still couldn’t stand her, but at least I could see a little bit of improvement)…in this series, it seems like she took some major steps back in terms of acting — I felt like I was watching one of the ‘beginning of her career’ performances where she has no clue what she’s doing and everything just looks / feels fake (plus I was having huge difficulty understanding her dialogue, especially during those emotional scenes when she had to say her dialogue really fast or cry while talking). Throughout the episodes that I watched, one thought kept swirling around in my mind: poor Ruco being paired up with yet another incompetent actress…. Jayne will probably post by tomorrow. The emoticons will say it all. Sometimes I think maybe it is Ruco’s fault that he is not Bobby Au Yeung who seems to bring the best out of his lesser female co stars and is divine with ANY actress, I bet even Aimee. Oh I forgot about Ruco and ideal role. Hanzawa Naoki with Elaine as the wife. Because Elaine looks like the actress in Hanzawa. Bobby is in a league of his own, so definitely hard to compare others with him. I think part of it has to do with his playful personality — he has a way of making everyone he films with feel at ease on set, which is a rare skill of you ask me. I agree in Kristal Tin so maybe TVB should match Ruco with a more mature looking actress. It is funny how many of us thinks Bobby as playful personality when in interviews, he gives me an impression of someone rather shrewd and someone you never want as an enemy. Just a feeling. I thought Ruco had very forced chemistry with Linda Chung in Brother’s Keeper, didn’t really go too deeply with Tavia in Other Truth, small budding thing with Priscilla in GPS, even going back to My Date with a Vampire 3 – he was paired with teenage looking girl. I find he has more chemistry with Louisa Lee than most of the other actresses combined. Did anyone notice how he massaged the leg of the actress who plays his mom in Outbound Love when she first appeared? And when I say massage it was touch up and down? Gez man, the only reason I’m watching this is because they filmed it in M’sia… I think I’ll switch to other series… even queen divas kinda sucked…..
Queen Divas sucked big time. I liked Queen Divas for the turn off your brain Chinese New Years type of comedy. Didn’t have to take it seriously and most of the jokes were like watching variety show. Sad to say I have to pass this series and Ruse of engagement because of Aimee Chan. Her acting is quite bad. I hope that she won’t be given any lead role after these two series. It’s fine if supporting since I can skip her part.. I just finished this series. It was better than I expected and Aimee’s acting isn’t that bad actually. A few of her sad scenes did touched me but her laughing scenes were too exaggerated and too much, especially during the middle of the drama where she was practically laughing throughout the episodes. I enjoy reading Funn’s Episodic Thoughts and agree with her assessment of this series. Ruco has put in a stellar performance worthy of a TV King award. Aimee, well, heaps of room for improvement!! Her laughs sound fake and her troubled looks were stiff. Personally, I was disappointed with Brother’s Keeper. The storyline had so much potential but the script just didn’t quite make it. TVB had done a few of these cross-decades epic series before in the 90’s they were much better written than Brother’s Keeper.